Change Appears Inevitable In Syria, Analysts Say A U.N. resolution condemning Syria for its brutal crackdown on protesters faces diplomatic challenges, and the U.S. is considered unlikely to intervene militarily. Still, Syrian experts believe President Bashar Assad's loss of credibility will ultimately cause him to relinquish power. 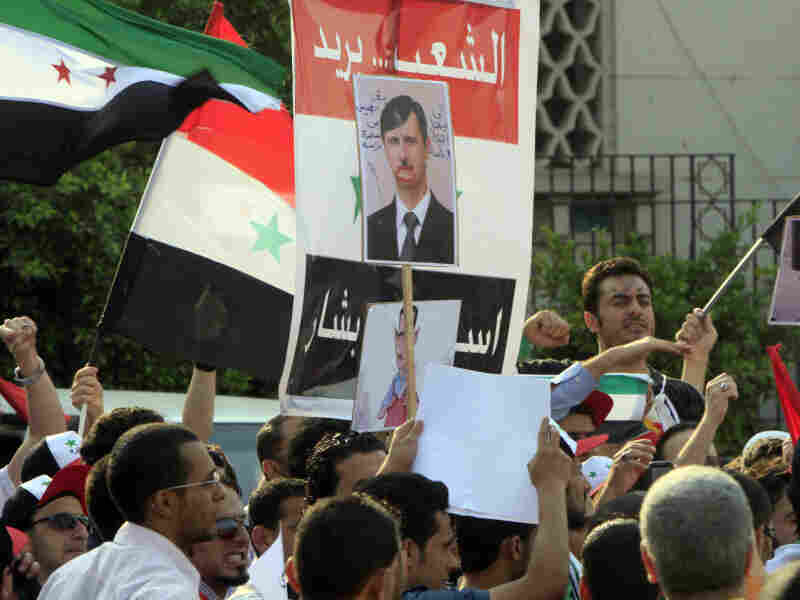 Protesters demand that Syrian President Bashar al-Assad step down, in front of Arab League headquarters in Cairo. U.N. Security Council diplomats have been studying a draft resolution condemning Syria for its deadly crackdown on demonstrators protesting the rule of President Bashar Assad. As the crisis drags on and the Security Council weighs its options, U.S. policymakers are trying to plan for what might come next. In Washington, there is a growing sense that Assad's rule is coming to an end. So far, the U.S. and its partners have been unable to get the Security Council to condemn the violence. The resolution under consideration was drafted by Britain and other countries, but diplomats are trying to persuade Russia not to block it. For now, this division plays into the hands of Assad, says Murhaf Jouejati, a Syrian-born professor of Middle East studies at the National Defense University. "The Assad regime knows full well that there are divisions in the Security Council. They know that the U.S. will not intervene militarily in Syria. They know that there is going to be opposition in the Security Council by Russia and by China to condemn Syria," Jouejati says. "If things, I think, were held equal today, the Assad regime will survive, but it's not going to be able to survive for very long." Jouejati says the political and economic costs of the crackdown are rising quickly, and he thinks there's no going back. "The Assad regime has lost credibility, it has lost legitimacy, and what is going to be needed for it to fall is really a pincer movement between the international community and [the] domestic society that is in an uprising against the regime," Jouejati says. There is a growing sense among Syria experts that change is inevitable. At least, that was the mood among analysts gathered for a recent discussion at the Carnegie Endowment for International Peace. Tamara Wittes, the deputy assistant secretary of state for Near Eastern affairs, represented the U.S. government there. "One way or another, change is coming. And it's very important for us, all of us, therefore, to focus on how that's going to happen. Because how it happens is as important — in fact, in some ways at this point, more important — than when. Change is inevitable," Wittes said. So the U.S. needs to start making plans, says Andrew Tabler of the Washington Institute for Near East Policy. "The U.S. has to think about a strategy for bringing about what kind of government it would like to see in Syria after the Assads go," Tabler says. "This might not be something that happens right away; this will take a lot of time. But there's a general agreement that while the Assad regime is not at a tipping point, it is on a downward trajectory and we all have to prepare for that." Tabler says the Obama administration also recognizes another key point when it comes to Syria. "The Assad regime is not an ally of the United States. In fact, it's an ally of Iran, so this is a golden opportunity to be on good terms with the incoming powers." Tabler thinks the U.S. can do more to help opposition figures get organized and counter Internet restrictions. The U.S. should also continue to try to squeeze the Assad regime financially, he says. "When they give [Assad] a choice between lead democratic transition or, sort of, get out of the way, they really mean get out of the way either with some dignity or without dignity. So in a sense, they are pressing for complete change and overhaul of the system," he says.